Brielle’s practice focuses exclusively on personal injury litigation, which has grown from a desire to help those victimized by the negligence of others. She has successfully litigated cases to verdict in both bench and jury trials across the state. Most recently, she served as the second chair at a multimillion-dollar medical malpractice trial, earning the fourth-highest jury verdict in Virginia in 2017. She is licensed to practice in all Virginia courts and the Eastern and Western District Courts of Virginia. 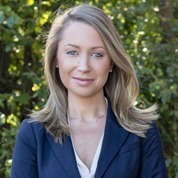 A native of New Jersey, Brielle graduated from the University of Richmond with a Bachelor of Arts degree in psychology and minor concentrations in medical humanities and leadership studies. Brielle went on to earn her law degree at the University of Richmond T.C. Williams School of Law, where she served as chief justice of the Honor Council, president of the Medical-Legal Partnership of Richmond, magister of the Madison Inn of Phi Delta Phi Legal Honor Society, and manuscripts editor of the Richmond Journal of Law and the Public Interest. When she’s not zealously representing clients in the courtroom, Brielle volunteers her time at her alma mater, advocating for victims of sexual assault through the Title IX process. She enjoys traveling, cycling, outdoor concerts, and exploring Virginia wine country. Brielle lives in Glen Allen with her husband Alex and their golden retriever, Paisley.